Handful by handful, Deborah Michael sifts through thousands of dead honey bees, devastated. She's concerned they could be Zombie Bees. Michael has been in contact with the Centers for Disease Control. She sent several samples to their headquarters for testing. She's just hoping scientists can figure out what killed off her bees. Out of 10,000, just a couple dozen of her Russian honey bees remain. Michael is able to scoop up the bees' bodies where they collected just outside the entrance to the hive. A reminder of the mass kill-off that occurred just a couple days ago. "Sunday morning I noticed there was a tremendous increase in their aggressive behavior," said Michael. "The bees were just falling over. Some of them had larvae coming out of their necks." And that was Michael's first clue that the zombie parasite might be to blame. You'll remember, honey bees infected by a parasitic fly will take on zombie like characteristics until they die. That's when larvae will emerge from their bodies, continuing the fly's life cycle. Michael doesn't know if the zombie fly is to blame, but she's devastated to lose nearly her entire hive that she's worked to grow for 4 years. "I sobbed my eyes out," said Michael. "It's like watching a child who's sick and there's nothing you can do. There was nothing I could do." Another characteristic of infected bees: They leave the hive at night and fly toward bright lights. Michael said that's been happening, too. Again, Michael doesn't know if the zombie fly is to blame. 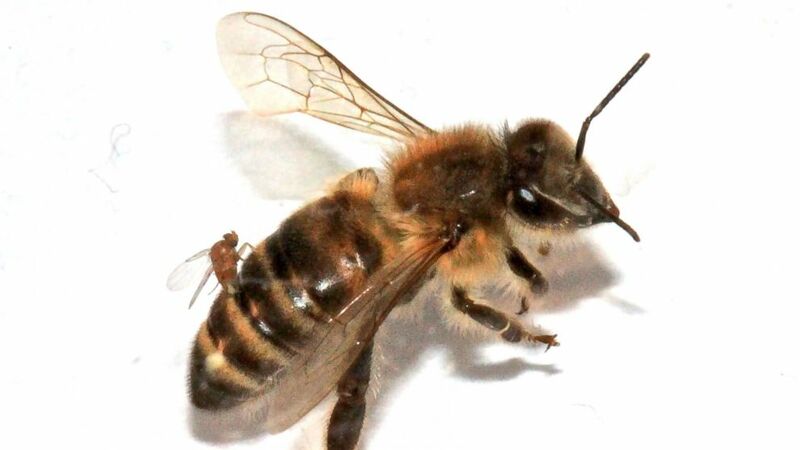 Bees also fall prey to mites, viruses and colony collapse disorder. She's hoping to get some answers from the CDC. They are honey bees that have been parasitized by the Zombie Fly Apocephalus borealis. Fly-parasitized honey bees become "ZomBees" showing the "zombie-like behavior" of leaving their hives at night on "a flight of the living dead." The fly is native to most of North America. It has expanded its host range to include the non-native honey bee, the most important pollinator of agricultural crops.